The Heritage Foundation recently published a report on the refugee resettlement program, “The U.S. Refugee Admissions Program: A Roadmap for Reform.” The report has factual errors or misleading statements on almost every page. …local affiliate funding is based on the number of refugees they serve, so affiliates have an incentive to maintain or increase the number of refugees they resettle each year rather than allowing the number to decrease. Refugee resettlement has averaged about 60,000 people a year since FY 2000. The Trump administration reduced the annual refugee cap for fiscal year 2018 to 45,000. VOLAGs have complained and protested about this modest reduction, yet in the two years following 9-11, it fell to less than 30,000. 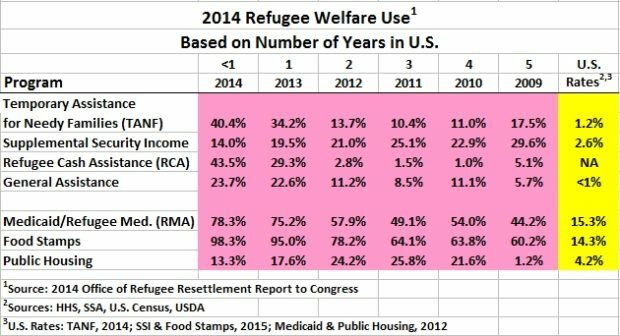 But refugee resettlement is actually only a small component of the overall program. 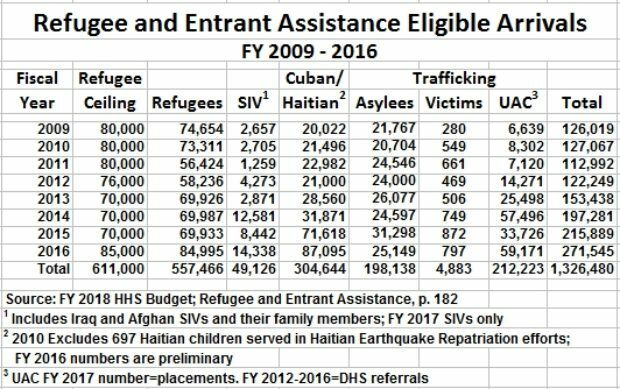 The following groups are processed through the refugee program: refugees, asylees and families, Cuban/Haitian Entrants, Special Immigrant Visas (SIV), trafficking victims and unaccompanied alien children (UAC) – over 270,000 people in FY 2016 (the last year for which complete data are available). Once established as legal permanent residents, they can invite family members and are encouraged by the VOLAGs to do so. The following table shows the true size of the resettlement program. While UACs do not meet the refugee definition, they are managed by the refugee program anyway, and actually receive the lion’s share of ORR resettlement money (see refugee budget table below). A small percentage of UACs are already designated as refugees through the Unaccompanied Refugee Minor program, in operation since the 1980s. The current system encourages corruption. Resettlement contractors seek to entice local “stakeholders” with the promise of federal dollars, while simultaneously misrepresenting or hiding the true costs of refugee resettlement, and dismissing concerns over vetting. This tendency was aptly demonstrated in 2016 when the mayor of Rutland, Vermont conspired in secret with the VOLAG affiliate to initiate a new refugee resettlement program. City outrage saw to his defeat by an 18 point margin in 2017. “I got smoked,” the mayor admitted. VOLAGs are required to invite state and local officials to quarterly refugee “stakeholder” meetings and consult with those officials before resettling refugees. In practice, they often neglect to do this. For example, Oakland County, Michigan, has received more refugees than any other Michigan county, but until 2016, had never been invited to a single stakeholder meeting in the entire history of the program. Nearby Macomb County, however, has been invited to every single quarterly meeting for decades, because Macomb actively supports the refugee resettlement program. The USRAP program is vulnerable to fraud. For example, the refugee P-3 program (family reunification) was shut down for years because 80% of North-African applications were found to be fraudulent. Somali “refugees” resettled in America now make extended trips home to visit relatives — defying the very definition of “refugee.” In Minneapolis, refugees living in public housing who return to Somalia for extended visits pay only minimal rent while they are gone. The asylum program is even more vulnerable to fraud — and has fewer security precautions than refugee resettlement. Economic self-sufficiency is the buzzword for the resettlement community. HHS’s Office of Refugee Resettlement (ORR) publishes statistics boasting of refugee self-sufficiency at 120 – 180 days. However, ORR uses a special definition of “economic self-sufficiency” which only requires a refugee to be employed and ineligible for cash assistance. Refugees can continue to receive all other forms of welfare. In fact, despite the assistance refugees receive, long-term welfare use dwarfs that of all other groups. The refugee resettlement program enjoys bipartisan support. Many Republicans see it as an example of refugees performing jobs Americans won’t do. Manufacturers are attracted to the low cost labor. But in fact, that labor is subsidized by the American taxpayer. The table below illustrates the problem. Each family in the example has two adults and two children. Family 2 earns roughly the minimum wage. But welfare benefits available to that family bring that rate up to: $32,220/2,080 = $15.49/hour. The manufacturer relies on U.S. taxpayers to augment its wages. Forced to pay $15/hour itself, the firm would find many more American takers. Report: “VOLAGs receive as much as $1,800 per refugee from the State Department” to cover initial resettlement costs. Correction: VOLAGs receive $2,125 per refugee, of which $1125 must be spent on the refugee. The rest covers the VOLAG’s administrative expenses. Report: “Refugees are required to obtain a green card granting legal permanent residence within one year of arrival. Upon obtaining a green card, refugees are eligible to access benefits from roughly 90 means tested government welfare programs according to the same income-eligibility standards applied to U.S. citizens.” Correction: Refugees can access most, if not all of the 90 means tested government welfare programs upon arrival. Report: “Refugees also become eligible for Social Security and Medicare after 40 quarters of employment ” Correction: Refugees can obtain Medicare and Medicaid after 30 days if they qualify. Refugee Medical Assistance (RMA) is available for those who don’t. 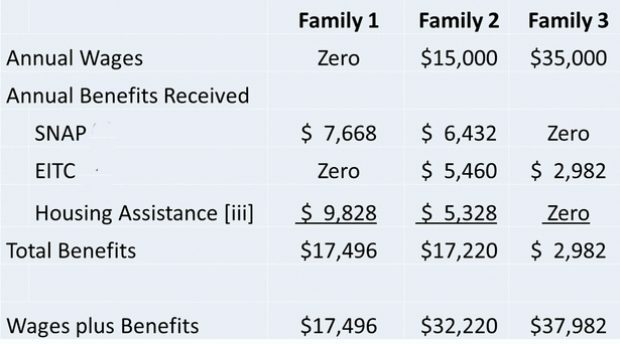 Refugees also access Supplemental Security Income at very high rates, replacing Temporary Assistance for Needy Families (TANF) cash assistance when TANF expires. See welfare table above. Report: “Figures of how many refugees in the United States have been involved in terror-related activity since September 11, 2001, range from three to 40.” Correction: Attorney General Sessions has reported that of 1,000 active FBI terrorism investigations, 300 involve refugees. The Trump administration has proposed creation of “safe zones,” i.e. helping refugees in place until they can return to their home country, and focusing diplomacy on that effort. The report instead suggests “refugee friendly” economic policies in the frontline countries. The vast migration from Africa, the Middle East and elsewhere is not a refugee crisis. Most are economic migrants. This recommendation will encourage more. This is a current requirement for citizenship, but it is not effectively enforced. Furthermore the proposal relies on VOLAGs to foster assimilation — something they are supposed to do now. Finally, Muslim refugees are being told by leading Muslim organizations specifically not to assimilate. This contradicts policymakers’ “moral and constitutional duty to care for American interests first.” Communities have been demanding relief from the many burdens imposed by refugees. These proposals asks them to shoulder more. This rephrases the first proposal focusing on front-line states but specifically targets Middle Eastern states. For example, currently, the Gulf states surrounding Syria accept no refugees at all, although some expatriate Syrians working in Saudi Arabia have been granted long-term residence. This and helping refugees in place should be the primary, if not exclusive focus. These groups, especially Christians and Yazidis, have been horribly persecuted by ISIS and other Muslim groups in the Middle East. They deserve P-2 “special humanitarian concern” status, probably more than any other group of refugees. Under President Obama, their plight was largely ignored. Of the Syrians resettled to the U.S. between 2012 and today, 1 percent (229 individuals) were Christians and Yazidis. 98.4 percent were Muslims. This proposal calls for improvements in the databases used to vet refugees. It is necessary for the overall immigration program but will have little effect on refugee vetting because so many refugees/asylum seekers have no electronic records. The current system relies on private contractors who resist any change that threatens their income stream. This system is further entrenched by big business interests that benefit from taxpayer-subsidized low-wage labor, and Democratic politicians who see all immigrants as a potential new pool of voters. As it stands, U.S. policymakers are ignoring the needs and interests of American citizens. By endorsing the current system, Heritage virtually guarantees that none of the recommendations it proposes will be enacted, or if they are, could be easily reversed under a different administration.